8 egg whites, room temp. Heat the cream and take it off the heat just before boiling. Pour over the chopped chocolate and stir gently until the chocolate melts. Cover with plastic wrap and set a side until cool. If making the same day then refrigerate. Preheat the oven to 475F/245C. Prepare two baking sheets with parchment paper. Sift and blend the powdered sugar (except for 2 tbsp), cocoa and ground almonds. Add the nut pieces that are too big to get through the mesh, when done sifting. Whip the egg whites 2-3 min, then add the 2 tbsp of powdered sugar and the vanila extract. Whip until stiff. Gently fold all the ingredients into the egg whites and immediately transfer to pastry bag. Pipe the batter in rounds about 1 inch or 2,5 cm in diameter. Pipe out all the batter. Leave to dry for app 30 min before baking. Put in the oven and turn down to 425F/220C and bake for 8 minutes. Remove the cookies from the baking sheet when cool. 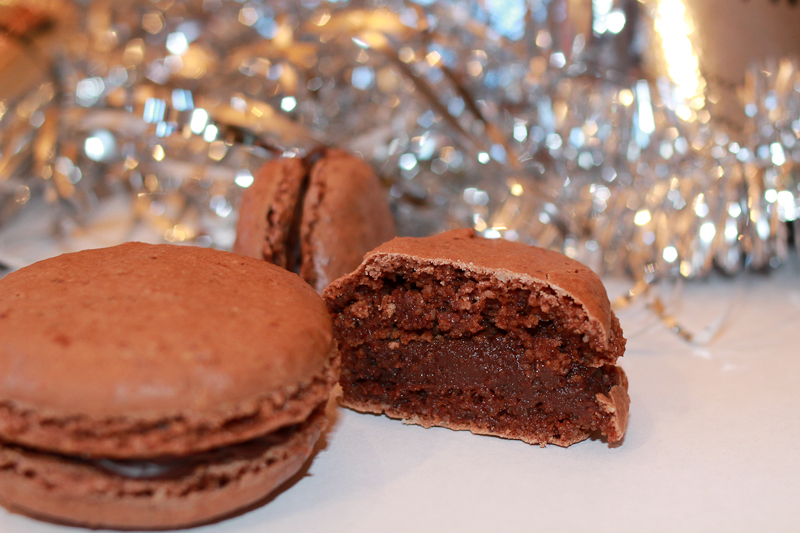 Assemble the cookies with the ganache filling and voilà MACAROONS! The recipe is adapted from Tante Marie’s Cooking School. This entry was posted in Sweets and tagged baking, chocolate, chokolademakroner, ganache, healthy food blog, macaroons, makroner, recipes. Bookmark the permalink.